Biography: Samuel and Prossy co-pastor World Wide Christian Church, which was started in 2010. The church began in a small room with a group of only four people. After door-to-door and other massive evangelism, the church has grown. They plan to expand to accommodate the ever increasing number of converts which come to the fellowship each week. The vision of the ministry is to see more people coming to Jesus, with a focus on prayer. Kayunga is a town which is steadily growing in population and in churches. The church has nursery and children's ministries, with a youth ministry based on discipleship. Evangelism projects include door to door evangelism, seminars, crusades, church planting, elderly and disabled support and HIV/AIDS care. 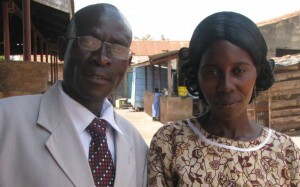 Strengths: Samuel and Prossy are gifted in evangelism and leadership.